Do you know a nurse who deserves recognition? 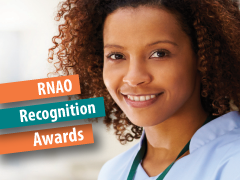 Nominations for RNAO’s Recognition Awards are now open. These prestigious awards celebrate the very best of nursing in Ontario. Consider colleagues who are worthy of recognition and submit a nomination on their behalf. The awards are divided into five categories – leadership, education/mentorship, group, undergraduate student, and member of the public – and foster excellence in nursing and promote the profession. The nomination deadline is Jan. 12, 2018. Winners will be recognized at the RNAO Annual General Meeting on April 20, 2018. If you have questions about the awards or nomination process, please contact Patti Hogg at 1-800-268-7199 ext. 220.